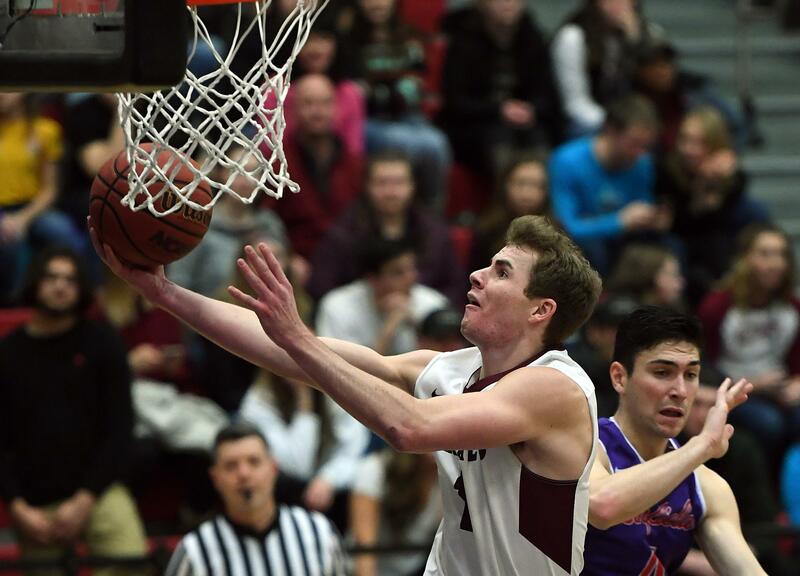 UPDATED: Fri., Feb. 8, 2019, 11:26 p.m.
Just like their previous game, the Whitworth Pirates found themselves behind most of the game Friday against the Linfield Wildcats. But again, when the Pirates needed stops, they got them. After struggling to stop Linfield’s 3-point shooters nearly the whole game, Whitworth ended the game on an 11-1 run, capped by Isaiah Hernandez’s end-to-end score with 13 seconds left to lift the Pirates over the Wildcats 74-73 at the Whitworth Fieldhouse. “I just got it and surveyed the floor and saw a lane and decided to go for it,” said the sophomore Hernandez, a Lewis and Clark High graduate. Dempsey Roggenbuck’s baseline jumper hit the side of the backboard and fell to the ground as time expired. The victory gave 15th-ranked Whitworth (18-4, 10-3 NWC) a two-game lead over Linfield (15-7, 8-5) for second place in the Northwest Conference (behind unbeaten Whitman, which clinched the top seed). It means the Pirates need one win in their final three regular-season games to clinch a semifinal home game in the four-team NWC Tournament. It was also their second straight come-from-behind victory following Saturday’s 77-75 win over Lewis & Clark. Roggenbuck’s miss on Linfield’s last possession was only his second of the night. He led all scorers with 23 points on 8-of-10 shooting, including 6 of 7 from 3-point range. Linfield hit 13 of 25 3-point attempts, the third Whitworth opponent to finish better than 50 percent from long range all season. The Wildcats led for all but 1 minute, 3 seconds, keeping the Pirates at least four points behind nearly the entire game. But Linfield didn’t attempt a 3-pointer in the final 4 minutes. Instead, it turned the ball over on four of its final six possessions, missing shots on the other two. Whitworth hit four of its final six shots. Hernandez came off the bench to score 13 points on 5-of-7 shooting, none more important than his final drive. The sophomore’s performance came on a rough night for senior Kyle Roach, who finished with a season-low six points on 3-of-9 shooting. He wasn’t the only one to struggle. Junior Ben College, the Pirates’ leading scorer at 20.9 points per game, had 15 and didn’t hit his first 3-pointer until late in the second half. But senior Jared Christy stepped up for Whitworth. He matched a career high by making 3 of 6 3-pointers, grabbed 10 rebounds and scored 21 points for his fifth double-double of the season. The Pirates came in leading the conference in rebounding differential (plus-5) and outrebounded the Wildcats 37-27. That included a season-high 14 offensive rebounds that they turned into 16 second-chance points. Whitworth plays at home again at 6 p.m. Saturday against George Fox (12-10, 6-7). Linfield women 80, Whitworth 72: Kory Oleson scored 15 of her game-high 25 points in the fourth quarter and the Wildcats (11-11, 7-6) took a big step toward securing the NWC’s final playoff spot by defeating the Pirates (11-11, 6-7). Camy Aguinaldo scored 24 points for the Pirates, who led 28-18 early in the second quarter. Published: Feb. 8, 2019, 11:01 p.m. Updated: Feb. 8, 2019, 11:26 p.m.